Human Proportions Go directly to the Real Color Wheel Main Page Element and Crystal RCW Charts. START page= art.htm. Paintings, Pigments, Media, Crystals, HEX codes, my Navy if you want to leave this home painting INDEX page. All About Color The complete (final.htm) RCW COLOR COURSE. 1 Location,Teaching his Drawing and paintings techniques done on location in buon fresco, water colour, oil, cera colla wax and acrylic paint. A life-time of painting. Seventh Grade students, Fresco Class, Waldorf School, Maui, Hawaii. art5 htm, Computer coloring lesson, blank coloring book. complementsneutral htm, Using complements to make neutral darks and shadow colors. 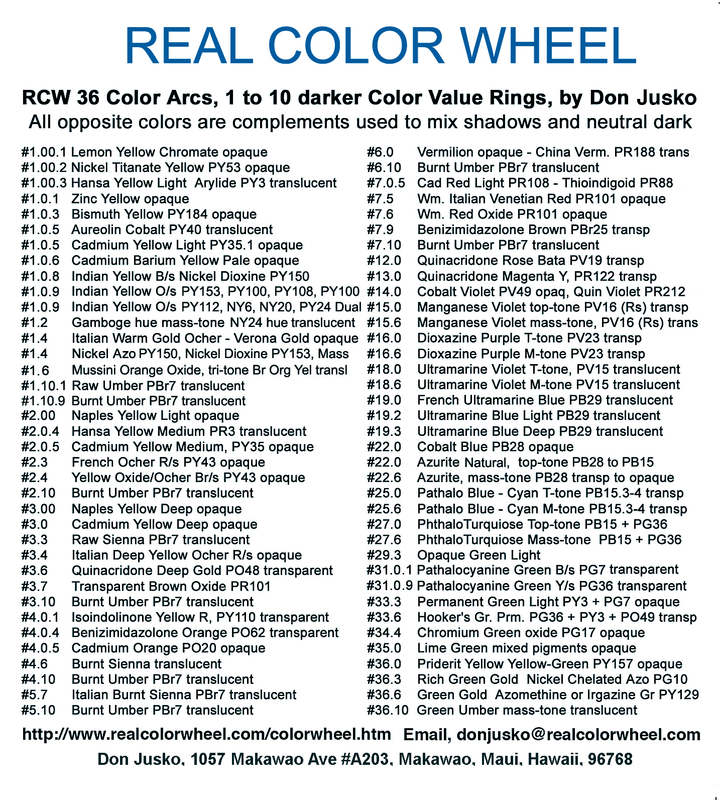 using the Real Color Wheel with painting tips and examples. START PAINTING INDEX step-by-step start to finish. All Paintings are done on Location, acrylic, alkyd, oil, w/c, pastel, wax, egg, fresco. The last painting's backward links are on this "end.htm" page. Start Chronological List of All Work. Painting Log, 1980 to 9-9-85, sold 15 years of my work, no painting links. *East Coast, 1st trip to Upper N.Y.
*Oil Pigments, START=RCW#0, 0White.htm Index to 36GreenGold.htm, 1 of 36 color links. *Oil Pigments, END=RCW#36, 36GreenGold.htm 36 of 36 painting colors. End of the Chronological List of paintings on location and information pages. "END.HTM" page has backward links toward the first painting. It only shows the last few painting worked on. *Hexadecimal RCW Codes for tints and shades, web designers, print artists. *Maroger's Medium, Black Oil Painting, everyone should use it. *Mold will eat you're paint. *This page can get you started making fine, deckled water color paper. *After Image Colors, Opposition Colors, Optical Simultaneous Contrast. *Bouguereau, sicatives, metal element oil driers. Yellows worse than oil. 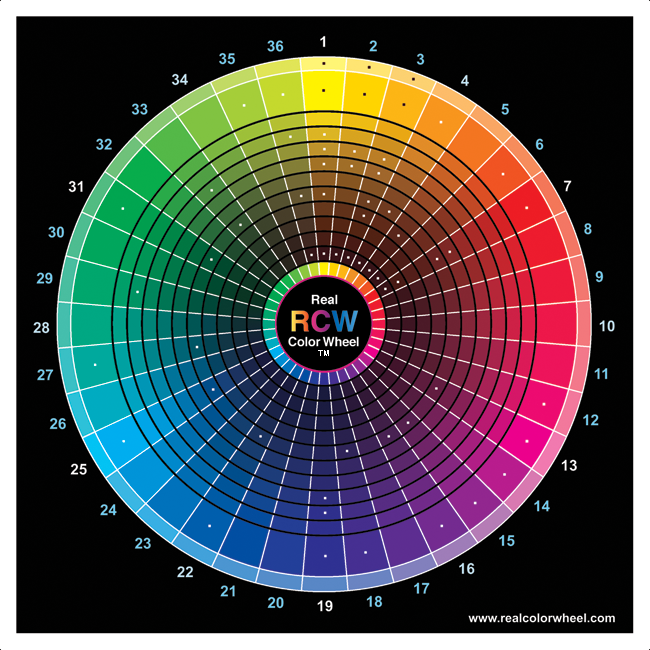 *RCW CMYK color plates show how crystals and pigments get darker. 14 Important Opposite Pigment Colors making dark shadows. Computer Ready, Pattern Outlined, Maui Magic Coloring Book. 15 original Whale paintings of a baby whale traveling from Maui to Alaska.